Blind guys are not supposed to run, right? They are supposed to walk tentatively, tapping out their paths with white canes. And they absolutely, without a doubt, unequivocally do not run in races. So what were two blind guys I know – both veterans and part of the Wyakin Academy for Wounded Warriors – doing at the Meridian Gold Rush Half Marathon/10K/5K this weekend? What if they ran the wrong way? What if they collided? Or tripped? It would be the Keystone Kops with sunglasses. It would be the end of the Cal/Stanford football game. 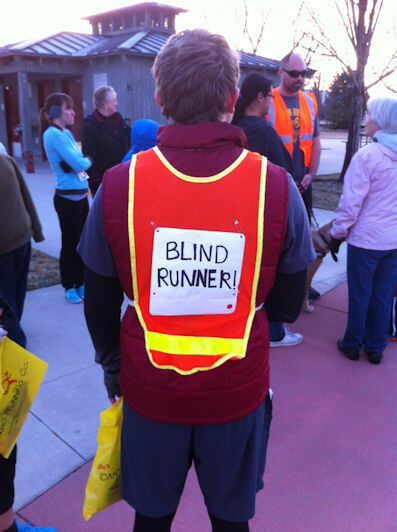 Well if blind guys aren’t supposed to run, Colby Morgan and James Nealey didn’t get the memo. They are both blind veterans. Newly blind, actually, so they are still getting used to life without sight. And today they both raced. No guide dogs, no canes, no tapping. They ran. Not tandem biking on a flat course, by the way. They use separate bikes and ride at a ski slope in the off season. And during the winter when they can’t mountain bike, they ski. They are also members of a goal ball team called Boise Blaze. If you have never heard of goal ball, think indoor soccer with blindfolds. I overheard James say to a friend that when someone tells him he can’t do something, he wants to prove he can. And today, in the cold, early morning in Idaho, he proved that he can run. And so did Colby. As Wyakin Warriors, they are going to college and are doing superbly. Some day soon they will graduate, run their own businesses and be leaders in their communities. And if you don’t believe me, just try telling them they can’t. If you are interested in supporting the Boise Blaze goal ball team, they need to raise about $4500 for uniforms and travel arrangements and could use your help. You can contact Colby directly by clicking here. For more information about the Wyakin Warrior Foundation, visit www.wyakin.org.